The first column explains what score this is – e.g. BPI is overall brain power, which each of the remaining items is a specific type of brain power. The dates represent when the brain power numbers are pulled from. The BPI reflects my percentile compared to all other users of Lumosity in my age bracket – so, for instance, my over brain performance index is higher than 69.2% of Lumosity’s users within my age bracket. 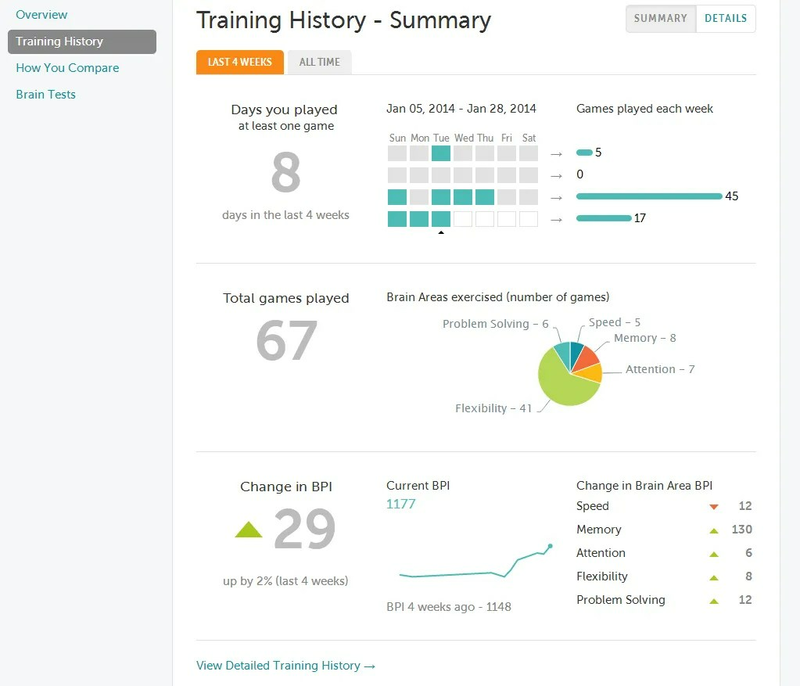 This is a screen capture of my Lumosity training History (Summary View) from Jan. 28th. It shows which days I’ve been using Lumosity, how many games I’ve been playing, in what areas I’ve been playing the games, and so on. I’ve actually moved into a new age bracket (30-34), but I’ve included the percentiles from 25-29 first since this was what I was using when I created the last post. The numbers within parentheses are the percentiles for my current age bracket. I should note that I’ve been a bit of a slacker recently. I missed an entire week of Lumosity, only did four days last week and have done three thus far this week – I’m trying to be more regular with it. I don’t remember what was going on in my life, but it seems like something which drew me away from Lumosity. Ohh well. The biggest takeaway is that my scores would probably be higher if I had been using Lumosity daily. Overall, I’m pretty impressed with Lumosity. I hate a few of the games (though I love most of them), though I’ve found if I’m willing to stick with them, after repeatedly beating my head against the monitor I eventually develop competency in them – though usually not until after I’m convinced I’ll never improve in them. For example, with the Penguin game (which still drives me nuts) I could originally only make it through 5-6 levels, now I can make it through 13…and the pinball game I could originally only do 3-4 levels and today I reached 11. Mainly the games that have to do with memory frustrate me – I enjoy the attention, speed, etc. games. Next story Margin Call (R): Movie Review. Previous story Some Pretty Awesome Deals from Amazon for eBooks.